I’ve never participated in a blog tag before but then I was tagged not one, not two, but THREE times, by Sarah @What Sarah Read, Angie and Ashlea @ Disquietus Reads, and Jessie @ Ageless Pages Reviews! Thanks ladies :D Now I feel special and figured I should answer ALL of their questions! Following Meg @ Cuddlebuggery’s example, I’m combining all three sets into one post. They will be labeled 1S, 1A,1J, 2S, 2A,2J, etc. It’s a lot but the questions were all so good! Instead of coming up with new questions, I’m challenging anyone who wants to participate to pick their favorite 10 from the list. I’m also tagging Lindsey @ Bring My Books, Laura @ Scribbles and Wanderlust, and Hannah @ So Obsessed With. 1S. If you could choose one book to re-read once a year for the rest of your life, what would it be? 1A. What is one book or series that you would make everyone read if you could? The Lynburn Legacy (http://gonewiththewords.com/2014/10/series-review-the-lynburn-legacy-sarah-rees-brennan.html). It has so much to offer in every way, and it is very hilarious, very swoony, full of action, and full of heartbreak. Plus Kami Glass is the best ever. 1J. What is your ultimate ship, your #1 “this is my OTP!”-level ship? 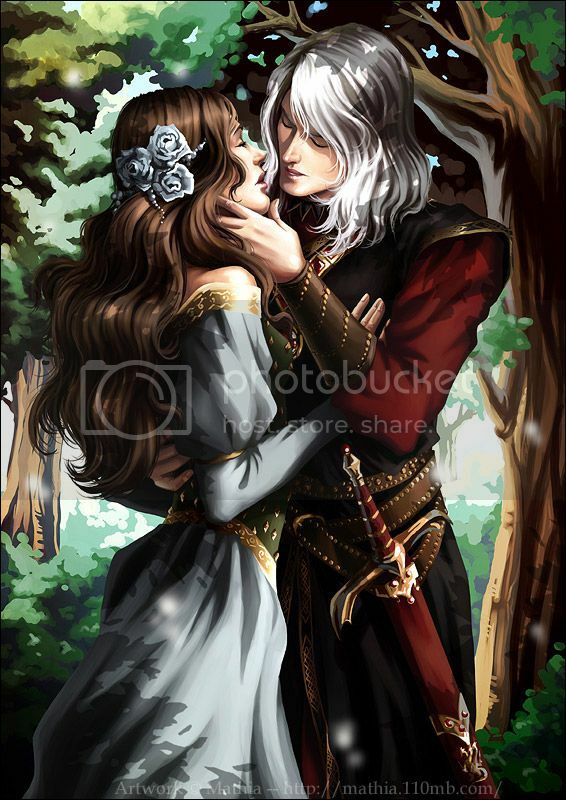 Rhaegar Targaryen and Lyanna Stark from A Song of Ice and Fire. For REASONS. Lots of reasons. Not just because Jessie asked this question. 2S. What book character have you identified with the most while reading? Julia from Meant to Be. I never went on a class trip to London, but I was always a rule follower and unamused by nonsense from teenage boys. I needed help loosening up haha. I love England, museums, books, having everything in its place, trading sarcastic comments with guys like Jason. And I always had a crush on some unattainable guy in high school. 2A. Who is your favorite book boyfriend/girlfriend? Oh god…. I think it’s still Etienne St. Clair from Anna and the French Kiss! Sah-woooon. I love Micah from Art of Lainey but he is def not my type in real life haha! 2J. If you could change the ending to any one book, what would it be and why? Allegiant because I thought the spoilery thing that happened could have been done in a more emotionally effective way. I don’t hate what happened but I hate how it happened because I think there were better options for the story. 3S. If you could choose a whirlwind tour of 5 locations from any of the books you’ve ever read, which would you choose. They can be real or fantasy! Pemberley (the Chatsworth House version! ), Hogwarts, the Department of Mysteries, Winterfell, BookWorld (from the Thursday Next series). 3A. What are your favorite book covers? I love the original American Harry Potter covers so much; they’re whimsical, colorful, and hold so much nostalgia. I also love Fangirl, the Mistress of Rome series (so gorgeous! ), The Glass Sentence (vellum!!! ), and Cruel Beauty. Plus let’s be real, I’m a sucker for pretty dress covers. 3J. Is there a book that everyone hates and you love? Wuthering Heights by Emily Bronte. I’ve read it 6 times and own multiple copies, it’s one of my favorites. I feel like most people I know hate it though. 4S. Recommend a book for someone who normally doesn’t enjoy reading. What book would you pick to change their mind? I think I would give them Throne of Glass, The Hunger Games, or The Da Vinci Code. Exciting, fast paced books with strong characters. I know so many people who aren’t readers who loved The Hunger Games. 4A. Name 3 fictional places you would move to in a heartbeat. Hogsmeade, Hobbiton, some fictional version of London because LONDON. 4J. Which book does the blogosphere go crazy for and you just don’t understand? The Mortal Instruments series by Cassandra Clare. I read City of Bones and thought it was entertaining but cliché. Too many cookie cutter scenarios and I didn’t care about the characters enough to find out what happens to them in the sequels. 5S. What is your favorite movie or television adaptation of a book you’ve read? Oh god, favorite EVER? I’ll go with the Lord of the Rings trilogy. It’s the rare adaptation that’s better than the books. Plus I love it :) HARD CHOICE THOUGH! 5A. What books are you looking forward to most in 2015? So many!!!! The short list: Red Queen, Raven Cycle 4, Throne of Glass 4, The Witch Hunter, Lion Heart, Hidden Huntress, The Winner’s Crime, Prudence, Rook, P.S. I Love You, Winter, untitled Kate Morton, The Winds of Winter (HERE’S HOPING). 5J. What is the worst book you have ever read? THE WORST. Why? Breaking Dawn (Twilight #4) by Stephenie Meyer. I really liked, maybe even loved, the first three books and Breaking Dawn ruined the entire series for me. It’s completely nonsensical; Stephenie Meyer flouts her own rules and mythology whenever she feels like it, characters treat emotions like they have on/off switches, and there are hardly any lasting consequences for anything or anyone. Completely maddening and not worth the midnight launch. 6S. What is your most anticipated book of 2015? The 4th Raven Cycle book. I wants the precioussss. 6A. Name your favorite and least favorite books of 2014. I’m assuming this means published in 2014… Favorites: Cress, The Assassin’s Blade, The Nethergrim, The Art of Lainey, Since You’ve Been Gone, The Winner’s Curse, Curses and Smoke, Heir of Fire, Blue Lily, Lily Blue. Least favorites: Landry Park (DNF), Glimpse. His Dark Materials. Modern fantasy classic, thought provoking, exciting, emotional. The Winner’s Curse. 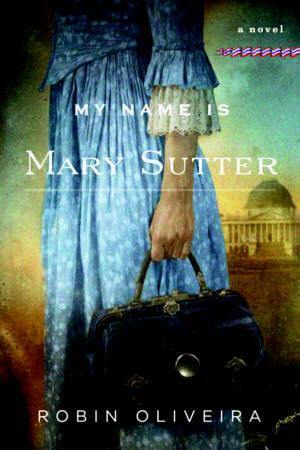 Beautiful writing, engaging characters, feels like historical fiction. The Raven Boys. Unusual, genre bending, lyrical writing, layered characters. 7S. What is the longest book you have ever read? A Breath of Snow and Ashes, 6th in the Outlander series. It’s the longest of the series so far, a whopping 1488 mass market pages. That’s a lot of small type! 7A. Who is your most owned author? J.K. Rowling. I have 3 complete sets of the American Harry Potter books (HC, PB, new PB), plus a variety of foreign editions in 10 languages. I think it’s 37 HP books total. 7J. What if there was only one book-to-movie production in 2015. You get to decide which book — so which one do you pick? 8S. What’s your best blogging tip? 8A. When and why did you start blogging? I started blogging this past September; I didn’t have the time to commit to a blog of my own but I was looking for somewhere to contribute reviews and bookish discussions- I still had a lot to say, I love books! Luckily Jess at Gone with the Word was looking for reviewers and the rest is history! It’s been a great experience so far contributing with my co-bloggers. 8J. Would you rather have a new Harry Potter series about Harry in his later years or a a Marauders-era book series? Ahhhh! HOW TO CHOOSE! If we’re being honest, I’d almost rather some Wizarding hist fic. Founders era and all. I think I’d pick Marauders because I’m super curious how James and Lily got together. Plus, the rise of Voldemort. 9S. Tell us about your favorite blogging experience you’ve had. Was it meeting a fellow blogger? Attending a conference or book signing? 9A. What is your favorite thing about blogging? Meeting other bookish friends to freak out about books with! Finding books I’ve never heard of. Also coming up with creative posts and hopefully connecting with others that feel the same way. 9J. How do you pick your next read? I stare at my bookshelf for a long time until something jumps out at me; usually it’s a book I’ve heard good things about via friend reviews. Or I pick a few books and stare at them, read a couple pages until I pick one. There’s not much of a system. If I have library books out, I try to read those first. Otherwise it’s total mood reading mixed with recs I see on twitter/blogs that make me run out and get that book. 10S. When and why did you start blogging? 10A. What hobbies do you have besides reading? I love to write, go to the movies, watch movies/tv at home, watch sports (NBA/NFL/WWE), play fantasy football, play with my beagle, drink tea, and bake! 10J. What book have you owned the longest that is still unread on your shelf? It might be Daughters of the Forest by Juliet Marillier and Taliesin by Stephen Lawhead. I think I bought them at the same time back in high school (11 years ago omg). IT IS TOTALLY ONE BOOK. Ahhhhhhhh I really want to read The Lynburn Legacy. I’ve heard so many great things about it. GOOD BOYFRIEND CHOICES. YES YES. I am so terrified to reread BD because I actually kinda loved it when I first read it (I think mostly in relief that Jacob and none of the Cullens were dead) but I’m pretty sure that opinion will change on a reread. Which I’m definitely doing in 2015 for reasons. I am so jealous of your HP collection. I only have the original HC and the new PB and I neeeeeed the new UK PBs. I would love a ToG TV show/mini-series. I think there is too much for a single movie but each book would make an awesome miniseries. READ THE LYNBURN LEGACY, IT’S SO GOOD. SMOOSH SMOOOOOSH COME ON RONAN, DO IT ALREADY. Well I am a Harry Potter maniac. I would buy the paperbacks as soon as they came out and would highlight them looking for clues about the later books (before those books were out). And in high school/college I would go on ebay looking for foreign copies all the time. YES the new UK pbs are gorgeousss! I bought book 1. 1A. Ahhh, I really want to read this trilogy – it’s been on my mental TBR for so long now and it sounds really great. 2A. Etienne is so swoon-worthy! I just wish he wasn’t short….I can’t let that go, unfortunately. There’s always a little voice in the back of my mind reminding me that he’s short! Hahaha. 2J. Totally agree with you about the execution! 4J. Totally agree with you. I actually read The Infernal Devices trilogy before I read City of Bones and I LOVED it! Hence why I started TMI…I’ve read the first three books, but they were such a let down after TID. 5A. There’s SO MANY wonderful books coming out next year! I’m looking forward to Red Queen, the fourth book in The Raven Cycle and The Winner’s Crime, too. 7A. Yep, J. K. is my most owned author, too. While I don’t own as many HP editions as you do, I’m not too far behind, haha. The next set I’m planning on collecting are the new UK hardcovers. 8S. Probably the best blogging tip I’ve ever read, hahaha! I do too, I had a lot of fun reading other people’s answers! Good, I was hoping it was one book ;) And oh please read the Lynburn Legacy this year! It’s so fantasic and a quick read too. Etienneeeee why did you have to remind me of his shortness?! I always manage to conveniently forget and then I get sad about it hahah. Interesting! That makes me want to try TID. The covers are gorgeous. Ooh lovely! You can never have too many HP books in my opinion. – Whereas I didn’t hate the ending of Allegiant the way that everybody else seemed to, I actually love what you said about it here! I could absolutely see it having been more powerful had it been done differently. – The Lord of the Rings trilogy!! I absolutely loved this entire series (although, I’m going to be honest – I skip Frodo/Sam parts in the third movie *hides behind anything so people won’t throw stuff*). My family got the 10 DVD extended edition/extra special features extravaganza, and the amount of random trivia I know about the making of those films is completely unnecessary and totally brilliant all at the same time. Haha! 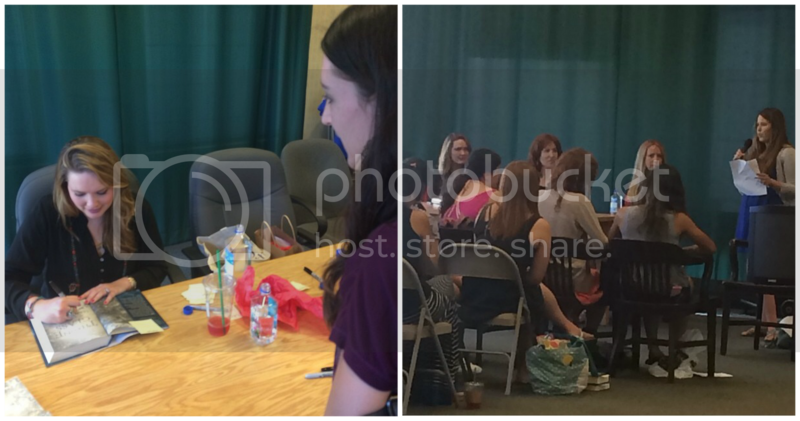 – I’m so jealous you’ve met Sarah Maas! (&&met Gillian!) What a cool day that must have been! – My friend tried to get me to play Fantasy Football once, it went disastrously – I had no idea what was going on and gave up so quickly, haha. Oh it's not spooky in that way at all! It's more atmospheric. Magic and stuff. It's very funny and swoony; the spooky really comes from the English countryside setting mixed with the magic. You will love it I think!! Hahaha I love that you know random LOTR trivia!! I have the normal DVDs but one of my old roommates had extended editions so I would watch those too. Awww yeah I'm still super excited!! It's fun posting on the blog :) And YES we are totally going to read Daughter of the Forest this year! Can't wait. Brb looking for a hobbit hole for us to share in Hobbiton, future roommate. Also let us make a pact to read Daughters of the Forest this year okay? Okay. I KNOW I KNOW I KNOW, I THINK ABOUT THEM ALL THE TIIIIME. This is the most perfect sentence I have ever read, let me know how the hobbit hole search goes because this is happening. Sorry husbands, we are needed in Hobbiton. Only room for books and tea. OOH, I didn’t realize Chatsworth House was a place you can actually visit but um, SO ON MY LIST NOW! I would totally want more Marauders-era HP too. IT IS and I’m sooooo bummed I didn’t visit when I lived in England in college! Just means I have to make a trip back I suppose :) It looks gorgeous and they even have the Darcy head statue from the movie! The bundle HP books, why yes, of course ;) I think everyone would pick that one. I would change Allegiant too. I love the movies from LOTR, although I think I like the hobbit more for two reasons: No Frodo & Richard Armitage, haha.